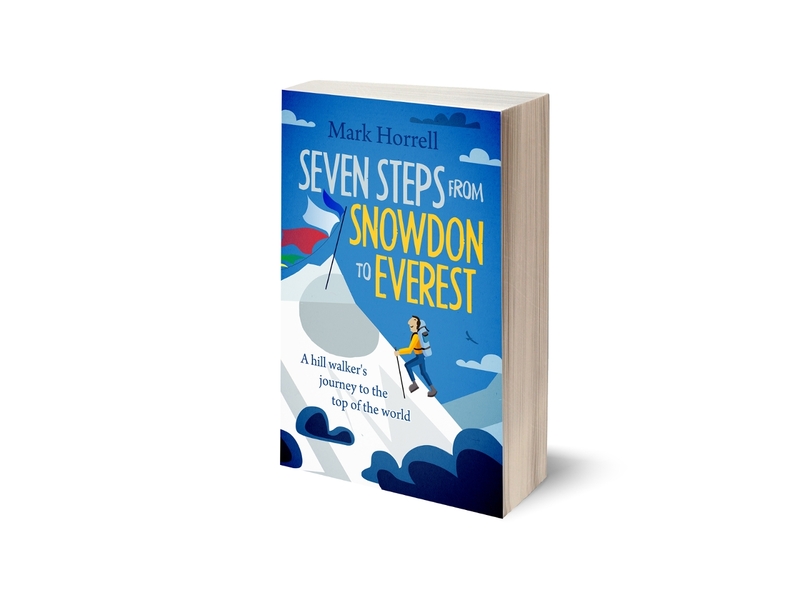 Another one for those of you who prefer to watch telly than read books. It’s that time again, when I show off the latest batch of classy videos that I’ve cobbled together in the garden shed with a pair of scissors, a roll of sellotape, and some sticky-back plastic. 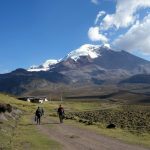 These ones cover our Chimborazo Sea to Summit Challenge last autumn, when we climbed 6,310m Chimborazo in Ecuador, starting from sea level on push bikes. Fans of my videos (have another drink, all of you) will be pleased to know that all the usual elements are there, including the shaky camera work and inane commentary. If you prefer to watch them all in sequence, then I have created a complete YouTube playlist for them, which is about 29-minutes long. If you’ve not done it yet and have a bit more time on your hands, don’t forget to read my various trip reports and dispatches about the acclimatisation, the bike ride, the trek, and the climb. To complete the Sea to Summit Challenge we were going to have to pedal from sea level to an altitude of around 4,300m. This wasn’t going to happen unless we were pre-acclimatised, so this first series of videos covers our acclimatisation programme. We climbed (or tried to climb) three volcanoes in Ecuador’s central highlands. Our first successful ascent was of a mountain almost everybody who goes trekking in Ecuador climbs at some point, 4,798m Rucu Pichincha. It’s arguably the country’s most accessible mountain, towering directly above Quito. It’s just a short hike to the summit from the top of a cable car above the city. The route crosses grasslands, before zigzagging up a scree slope, with an easy scramble just below the summit. Our other two acclimatisation peaks are two less frequently climbed volcanoes, that I wanted to climb because they were both peaks of which Edward Whymper had made the first ascent with the Carrels in 1880. We would be following Whymper’s route from Guayaquil to Chimborazo later in the trip. Cotacachi (4,944m) is a complex rocky peak a day’s drive from Quito in the north of the country. It was very cold and windy that day, and we found ourselves climbing in thick clouds that swept across the rocky south ridge. We turned back a couple of hundred metres short of the summit because verglas (thin films of ice on rock) would present a hazard on the way down. 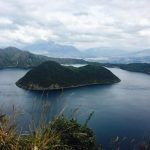 This video includes a hike around Cuicocha, the Guinea Pig Lake, a turquoise crater lake on the mountain’s south side. It’s a lovely hike that’s well worth a visit. Our third peak was a more familiar one that I’m surprised isn’t climbed more often. Sincholagua (4,873m) is the pink rocky peak that looks across the Limpiopungo Plains beneath the car park and refuge on Cotopaxi, Ecuador’s most popular big volcano. It took some creative driving by Pablo, our guide and support driver for the bike ride, to get our Toyota Land Cruiser up grassy slopes to a point that reduced our ascent to a short day hike. It was mostly a trek up rocky and scree-laden slopes, but the last 30m is a bit more technical. The final part is vertical, and as none of us were rock climbers we had stop just below the summit. We did the climb in mist, which cleared just as we were returning to the vehicle. We were surprised to look back and see that the very top of Sincholagua is in fact an ice needle. It’s no wonder we didn’t get up, but we do intend to return with a climbing guide some day and complete those last 30m. This slightly longer video covers the entire cycling part of the Sea to Summit Challenge. 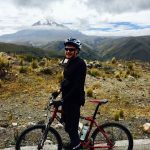 We started at sea level in Guayaquil, then biked up to the Chimborazo park gate at 4,300m. I started off positively, but food poisoning in Guaranda, halfway up the Andes, knocked me back. Some of this footage, recorded on Edita’s GoPro camera, makes painful viewing for me. Look out for the short clip of me lying on my back by the side of the road. Following my collapse just before the park gate, Edita had to whiz down the hill to Riobamba (2,800m) on her own. I rejoined her for the final day of the bike ride up the Pan-American Highway to the peaceful railway station at Urbina (3,600m). I was slowly on the road to recovery. This one’s a bit more pleasing on the eye. 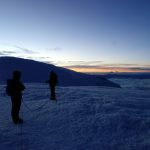 It features our trek round the east and north sides of Chimborazo and ascent of its sister peak Carihuairazo. The paramo grasslands on the east side of Chimborazo contained some of the nicest trekking I’ve done in Ecuador. By contrast the western side to Carrel Hut was stark and barren. Edita decided to round off this section with a run down to the park gate. Edita’s summit footage on Chimborazo really captures the joy we experienced on completing the challenge. Look out for a new, cleaner me describing the ‘jolly cold’ conditions on the summit in my ‘jolly tired’ state. There are times when I would have used less polite adjectives. The end of the video includes some fun and games we had in the Amazon jungle to celebrate our success.